#1 American Financial : Finance and financial products portal provides information and resources related to various subjects including mortgage rates, insurance quotes, home loans, money market funds, and more. #1 Loans USA : Mortgage portal offering information about real estate, mortgage rates, latest news, business loans, debt consolidation loans, and more. Also features a mortgage directory and market analysis. 123 Mortgages - UK Mortgages Guide : Offers a free, unbiased guide to various mortgages available in the UK. Also provides information on remortges, and bad credit. Endsleigh Finance : Offers mortgages, remortgages, loans, pension advice and life insurance. Explaining Mortgages : Provides in-depth information about mortgages and home purchase, including how to select a realtor, lender, which type of loan to choose, and more. 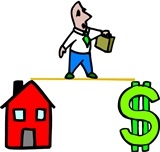 FancyAMortgage.co.uk - UK Mortgages : Offers information and comparisons on current UK mortgages. Also features mortgage enquiry form online and mortgage broker section. First Mortgage - UK Mortgage Qutoes & Info : Provides information on various types of mortgages such as fixed rate mortgage, capped rate mortgage, discount rate mortgage, variable rate mortgage and more. First Rung Now : Offering information and mortgage advice to first time buyers in the UK, including shared equity, shared ownership, part-buy/part-rent and buy-to-let mortgage schemes. Herne Group - CeMAP : Provides expert tuition, IFS (Institute of Financial Services) course material, mock exams and test papers. Also provides important advice and tips on examination techniques. My Property Hub - Buy to Let Advice : A one-stop-shop for property investment in the UK, offering professional buy-to-let mortgages, home insurance, mortgage advice, and more. Alpinebanker.com : Provides great rates and personal service on purchase, refinance and bad credit home loans. Esbs.co.uk : Offers a wide variety of savings and investment opportunities. Lending Tree : Interactive tools, personalized advice and comprehensive resources to manage finance successfully. Online Commercial Mortgages : Information on buying commercial property or raising finance for business with a commercial mortgage or business loan. TD Bank : Provides customers with a full range of financial products and services at more than 1,000 convenient locations from Maine to Florida.